Spring is finally here and it’s time to start getting fit and healthy once again so you will be feeling good and in top shape for summer. It also marks the return of the dreaded flea season which means all pet owners must assess current flea prevention plans and make sure that every pet is being properly protected. 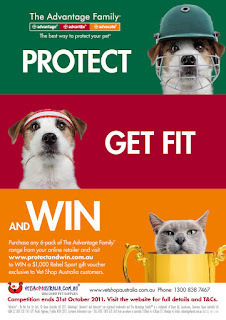 To welcome the return of spring, VetShopAustralia has teamed up with Bayer to give all customers the chance to Protect, Get fit and Win! Simply purchase any 6-pack of Advantage, Advantix or Advocate at VetShopAustralia.com.au between the 1st of September to the 31st of October and then visit the promotion page and enter your details for your chance to WIN a $1,000 Rebel Sport gift voucher, Good luck! My friends tell me Advantix is a great tick control product. I almost lost my GSP to a tick last year and I am not going to risk it so I am going to try Advantix to control ticks this year.